I’ve been SO curious about this book ever since I first heard about the book in Japanese a while back. And even more so when I learnt it had been turned into a film. Although I was a little disappointed that the title, Shokudo Katatsumuri (食堂かたつむり)）wasn’t directly translated as Snail Canteen but was changed to The Restaurant of Love Regained which makes the book seem a little like a romance novel. Even the title of the film, Rinco’s Restaurant is preferable. But I guess it’s a difficult title to translate and make it marketable. Nevertheless I looked forward to reading it. And it’s NOT a romance novel. It’s a quirky, modern novel, reminiscent of something by Kaori Ekuni or Haruki Murakami. It deals with some deep issues, loneliness, family, death in an unsentimental and yet tangible way. And I liked that. We are introduced to Rinko just after she has been dumped rather callously by her Indian boyfriend, who has taken everything and left her only with her late grandmother’s precious bowl of sake kasu used to make pickles, and returns home to a mother she despises. A child of an affair with a married man, Rinko grew up with her wild mother who has been running Bar Amour and listening to the woes of men. It’s been 10 years since she left the small town where she grew up to become a chef in Tokyo. The recent stress has made her lose her voice, yet her mother takes her back in and gives her a loan to start a small canteen where she cooks for one set of customers per sitting plus the task of looking after her mother’s pedigree pig, Hermes. Soon rumours begin to float that her dishes miraculously make wishes come true. As her heart slowly heals by making others happy, Rinko begins to rebuild relationships and learns to communicate again. And just as she is beginning to settle down, life throws a curveball. The translation by David Karashima is pretty much flawless apart from a few hiccups here and there that would probably only be noticed by readers fluent in Japanese. 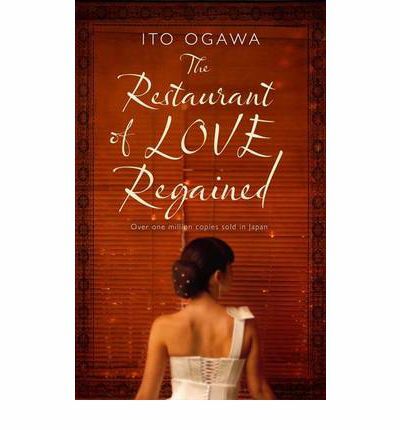 The Restaurant of Love Regained is so easy to fall in to, and yet, I wouldn’t describe it as a simple or easy read. The themes dealt with here go straight to the heart of modern Japanese living. Communication, relationships with people, the search for a happy and fulfilling life are all things which affect everyone. It makes you think about your life and what is important. I really enjoyed this novel, especially the descriptions of food which Rinko makes, although there is a part toward the end of the book which left me feeling rather squeamish. You may want to skim read it if you’re vegetarian, is all I’m saying! There is an earthiness to Rinko which makes you feel connected to the world. It makes you realise that people aren’t living in a materialistic bubble, that real life is all about getting back to your roots and to reach out to the people who love you. Saying that, this novel is hardly your standard saccharine fare but it does have a slight fairytale quality to it. Rinko doesn’t dwell on her heartbreak but puts everything into physically doing something. It’s refreshing to see and makes you want to go out and change things for yourself too. Check out the trailer here – Rinco’s Restaurant. And there’s even a recipe book in Japanese. Cool or what!? A big thank you to Alma Books for kindly sending me a copy of this book to review. So do I, Stu! Wouldn’t it be wonderful to cook something that one of your favourite characters ate? I’d not come across this book before reading your post, but it does sound good–unusual, too, which appeals to me. I’ve added it to my wishlist, though it doesn’t seem to have been published in the US yet. It was a little different from the other Japanese novels I’ve been reading and do recommend it, Danielle. I’m sure it’s only a matter of time before it’s published in the US (usually it’s faster there, I think). a lovely, funny, bitter-sweet novel and film. both are my favorite. surprised to see the english title and cover… looks rather heavily romantic. My thoughts exactly, it doesn’t really fit the story, does it? Oh my god, I will have to go and check out the translation of ‘oppai yama’ – I can’t remember much except I think it was something like ‘mountains that look like breasts’, ha ha. I am about half way through this work. I really like it a lot so far.